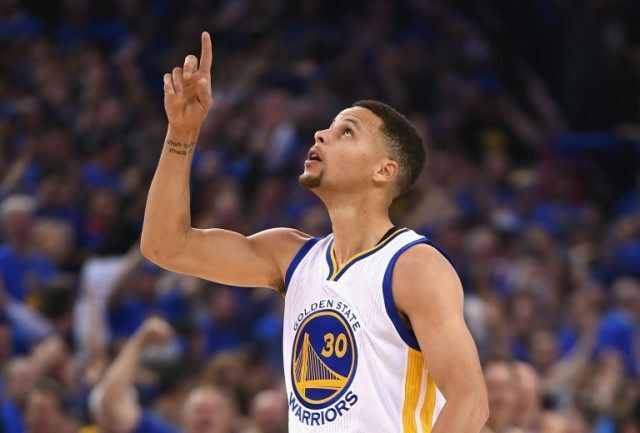 Los Angeles (AFP) – The Golden State Warriors etched their name in the NBA’s record book with an epic 73-win regular-season and head into the playoffs seeking a championship repeat to cement their status among the greatest teams in league history. “Who knows how far we can take this thing?” the Warriors’ sharp-shooting superstar Stephen Curry said after Golden State eclipsed the single-season record of 72 wins set by the Michael Jordan-led Chicago Bulls of 1995-96. But Curry and the rest of the Warriors know the astonishing achievement will count for little if they can’t go on, as the Bulls did, to win it all. “Now, obviously, we want to finish off the season in the right way,” said head coach Steve Kerr, who said his record-setting Warriors go into their first-round playoff series against the Houston Rockets with a “clean slate”. History is on the Warriors’ side. Of the 10 teams that won at least 67 regular-season games, eight have gone on to win titles. The three teams that won at least 69 games — the ’95-96 Bulls, the 1971-72 Lakers and the 1996-97 Bulls — all went on to win titles. Fears that the push to surpass the Bulls might wear out the Warriors before the post-season looked unfounded on Wednesday as they romped to a 125-104 victory over the Memphis Grizzlies. Curry connected on 10 three-pointers — just two off the single game record of 12 he shares with Kobe Bryant and Donyell Marshall — despite sitting out the fourth quarter. The reigning NBA Most Valuable Player finished the campaign with a jaw-dropping 402 three-pointers — shattering the previous single-season record of 286 he set last year. Curry finished the regular season with a scoring average above 30 points per game, and became the ninth player to achieve the 50-40-90 club: shooting at least 50 percent from the field, 40 percent from three-point range and 90 percent from the foul line. The Rockets don’t appear to have the defensive weapons to stop the Warriors. Houston have the worst team defensive efficiency of any team in the post-season. The Warriors’ biggest threat in the West looks to be second-seeded San Antonio, whose own superb 67-15 regular-season was overshadowed by the Warriors’ exploits. The veteran Spurs face an injury ravaged Memphis in the first round, the Grizzlies missing two of the players instrumental in putting them in the playoffs in point guard Mike Conley and center Marc Gasol. Elsewhere in the West, the Oklahoma City Thunder take on the Dallas Mavericks and the Los Angeles Clippers face the Portland Trail Blazers. In the East, Cleveland superstar LeBron James is displaying his most formidable form just as the playoffs arrive. James averaged 28.4 points, eight rebounds and 8.5 assists while shooting 63 percent in his last 10 games — sitting out the Cavs’ season-ending loss to Detroit in a preview of their first-round clash with the Pistons. “If he plays like this, man, we’re going to be tough to beat,” Cavaliers coach Tyronn Lue said of his superstar, who is still aiming to make good on his vow to bring a championship to his home state after twice lifting the trophy with the Miami Heat. James and the Cavaliers fell in six games to the Warriors in last year’s NBA Finals. Since then they have changed coaches, with Lue fostering a more dynamic offense. The Toronto Raptors, who couldn’t quite get past Cleveland for top seed in the East, are nevertheless confident they can improve on their first-round exit to the Washington Wizards in last season’s playoffs. The Raptors open at home Saturday, hosting the visiting Indiana Pacers. The third-seeded Miami Heat face a tough opening series against the sixth-seeded Charlotte Hornets who are hungry for playoff success after being swept in their past two post-season appearances. The Boston Celtics take on the Atlanta Hawks in an evenly matched series in which the point guard battle between the Hawks’ Jeff Teague and the Celtics’ Isaiah Thomas could prove pivotal.